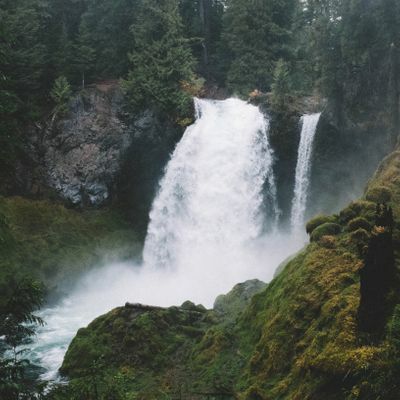 Get a quick introduction to Oregon's roaring rivers, waterfalls, and old-growth forests with a loop trail around the McKenzie River's two grandest waterfalls. From the Sahalie Falls parking lot, walk 100 yards down to the railed viewpoint of the falls. Start the loop by heading left from the viewpoint, following a "Waterfall Trail" pointer downstream. The river churns through continuous whitewater for half a mile before leaping off another cliff at Koosah Falls. Notice the massive springs emerging from the lava cliff near the base of the falls. Tamolitch PoolFor the loop, keep right at all junctions after Koosah Falls. In another 0.4 mile you'll meet a gravel road beside Carmen Reservoir. Follow the road right 150 yards to a trail sign, take the path into the woods 100 yards, and turn right on the McKenzie River Trail. This route heads upstream past even better viewpoints of Koosah and Sahalie Falls. After 1.3 miles, cross the river on a footbridge and turn right for 0.4 mile to your car. No one has reviewed Sahalie falls yet, have you been here?..